Internal control is a system in an organization that comprises of control environment and procedure, which help the organization in achieving business objectives while internal audit is an activity carried out by professionals to ensure that internal control system implemented in the organization works effectively. Control is one of most important human need, that is present in almost every human activity. So, in business, control have a great role to play to ensure best possible use of resources and increase profits. Most of the business activities in an organization are carried out by computers, individuals and other equipment, which requires to be checked periodically, to make sure that losses and wastes do not occur. Internal control and internal audit are commonly used interchangeably, but they have different meanings. In this article, i will be writing on the difference between internal control and internal audit. Inter control comprises of five elements, which are interrelated to each other and apply to all firms, but their implementation depends on the size of the firm. 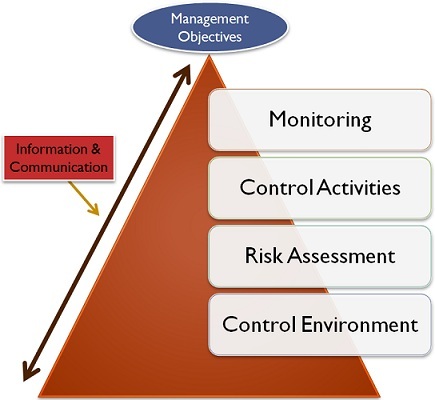 The elements include control environment, risk assessment, control activities, information and communication and monitoring. Checking whether the transactions are executed as per the management’s authorization. Examining prompt recording of transactions, in correct amount and account and that too in the accounting period, to which it belongs. Ascertaining that assets are protected from unauthorized access and use. To compare recorded assets with the existing ones, at various time intervals and taking actions in case differences are discovered. Review is one of the most important part of the internal control system, auditors can use any of the methods: Narrative Records, Checklist, Questionnaire, and Flowchart. Internal audit can be defined as an unbiased, rational assurance and consulting function, initiated by the management, so as to keep a check on the activities of the organization. Internal audit involves regular and extremely important analysis of the functions of an organization, for the purpose of recommending improvements. Internal audit is aimed at assisting members of the firm in carrying out their responsibilities effectively. The task of internal auditing in an organization is performed by the internal auditor, who is appointed by the management of a company. He/she reports directly to the management regarding the analysis, appraisal, recommendation and all relevant information relating to the activities under supervision. To examine the degree of accuracy and authenticity of the accounting records, which are reported to those charged with governance. To see if the standard accounting practices, which are deemed to be pursued by the entity, are complied with or not. It helps to detect and prevent fraud. To ensure that there is an appropriate authority for the purchasing and disposal of assets. To be sure that the liabilities are incurred only for business causes and not for any other purpose. To examine the activities of the internal control system of an organization, in other to report management regarding deviations and non-compliances. Finally, both internal control and internal audit are of great importance for every organization, to evaluate the overall working. The scope of internal control is wider than that of internal audit, as internal control includes internal audit.